In the spirit of stolen sorbet, I can't take any credit for this pilfered recipe. It originated way out West from Jess at L.A. Ritz, who, it turns out, got the idea during a trip East to Lupa. 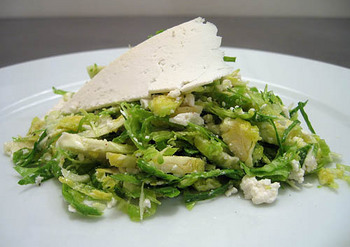 Amid the gray doldrums of this winter freeze, I was inspired to make this fresh and vibrant salad of raw brussel sprouts, pecorino, lemon, and extra virgin olive oil. Raw brussel sprouts do not sound particularly appetizing, I have to admit. But, I was intrigued by the recipe. Slicing the brussel sprouts thin, as Jess recommends, has the effect of removing some of the toughness and chewiness of their tiny leaves. Yet, even when sliced, those thin strands of green are so resilient they can still stand up to the richness of the olive oil and cheese. I couldn't access good pecorino, so I used ricotta salata, which I think was an appropriate substitute -- bearing the necessary twin qualities of saltiness and crumbliness. To make the salad, I thinly sliced six to eight ounces of raw brussel sprouts (this was about two thirds of the container they were sold in). Next, I combined the chopped sprouts with the juice of one meyer lemon, extra virgin olive oil, followed by salt and freshly ground black pepper. I crumbled thin slices of the cheese between my fingers before tossing it with the brussel sprouts. The salad would probably go with just about anything, and could even be a meal in itself along with some good crusty bread. It made a fine accompaniment to salmon fillets with leeks and carrots en papillote and couscous with wild mushrooms. N.B. : I was so enthusiastic about this salad that I tried making a variation substituting radicchio for the brussel sprouts. This was great too, though I found the radicchio wilted more than the brussel sprouts. You also have to love the bitter flavor of radicchio (as I do) to enjoy this version. The rustic salad served as a refreshing counterpoint to a partially pan-fried (then oven roasted) hanger steak. I made a similar concoction with almost the same ingredients (sans the cheese), but sauteed the sliced leaves and served hot. I decided that slicing the leaves is the only way to serve brussel sprouts! The recipe was in the new Gourmet cookbook. Damn Josh, your version looks much prettier than any one I've ever made. So steal away, and thanks for sharing the results! I'll have to try the sautéed brussel sprouts from the Gourmet cookbook and the radicchio salad twist (even if the latter doesn't hold up as well for leftover meals). Perhaps the green b.s. salad and its purple twin interpretation would make lovely contrasting companion pieces. Caryn, thanks for the tip! I'll look out for the recipe. Jess, Thank you for the inspiration! It's really good. Companion red and green salads? Sounds like a Christmas menu -- or an ecumenical latke party. Start slicing now for December 2005 . . . This salad sounds a lot like one I had in a restaurant in Nice, but the greens were raw artichoke hearts sliced very thin.